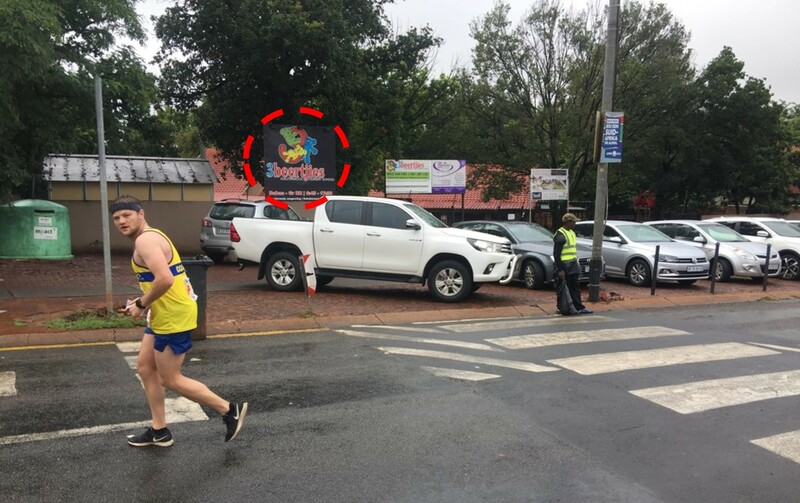 Pretoria, South Africa’s capital city, is crammed full of bureaucrats and civil servants who like nothing more than to capture everything in duplicate – this philosophy spills out onto the streets with all their road running events being double-lappers. 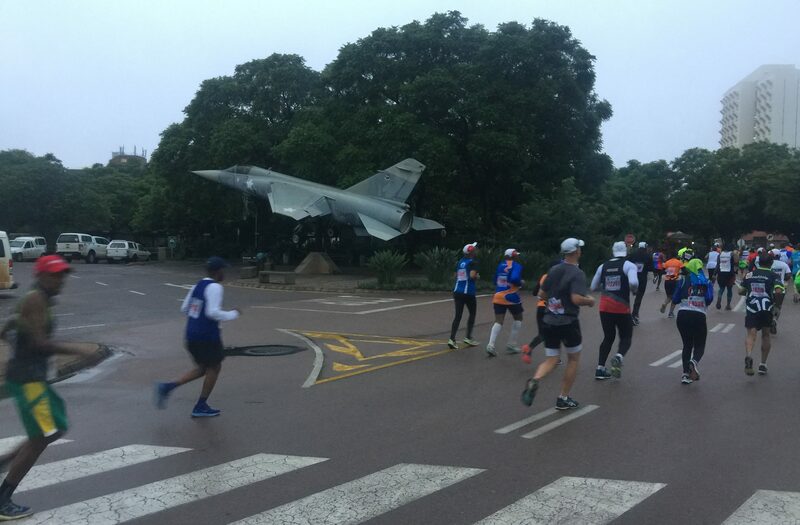 I am not sure whether there has ever has been a single-lap marathon in Pretoria but there has definitely never been one in Tshwane*. Call me a Doubting Thomas but when I heard that the Bestmed Tuks Marathon was a single-lap route I had to see it for myself to believe it. * The Tshwane Metropolitan Municipality was established on 5 December 2000, shortly before I started running, and I can’t remember doing a single-lap race of any distance north of the Jukskei. 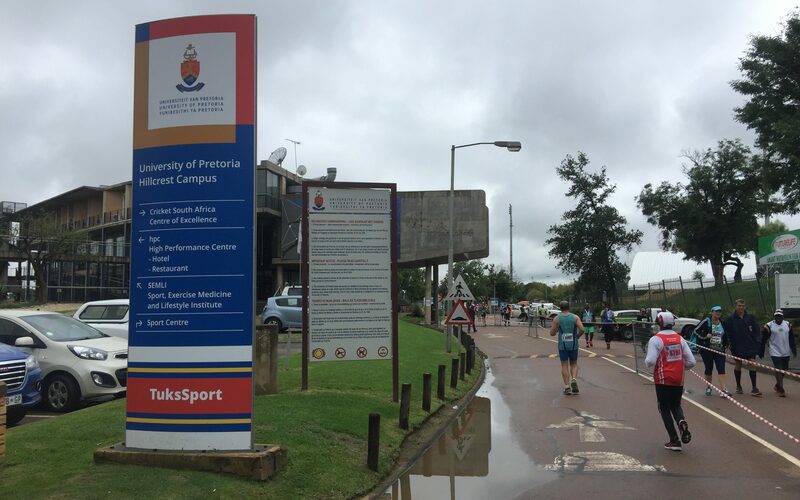 The race starts and finishes at the University of Pretoria’s Hillcrest Sports Campus. If you’re wondering how the nickname ‘Tuks’ is derived from ‘Pretoria University’, it is an abbreviation of the original name of the institution – the Transvaalse Universiteitskollege (Transvaal University College). 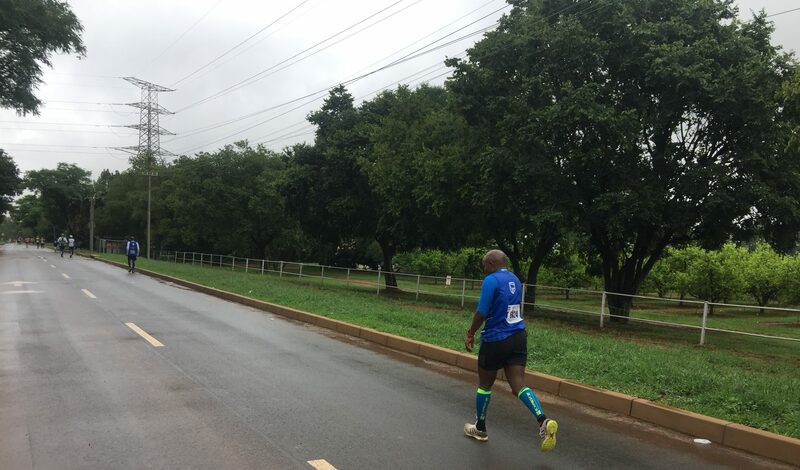 A one-lap marathon in Tshwane? Seeing is believing! 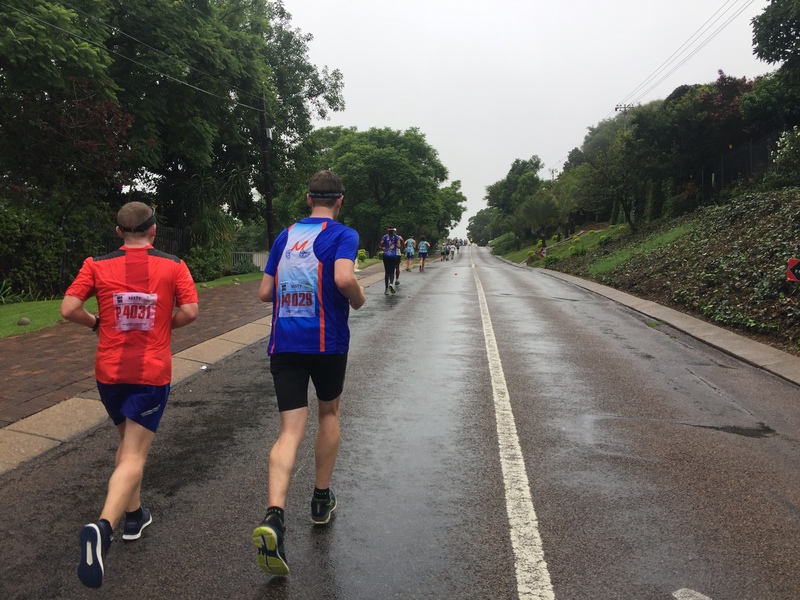 Tuks is one of the country’s leading institutes of higher learning – and their marathon is probably the toughest course they offer. 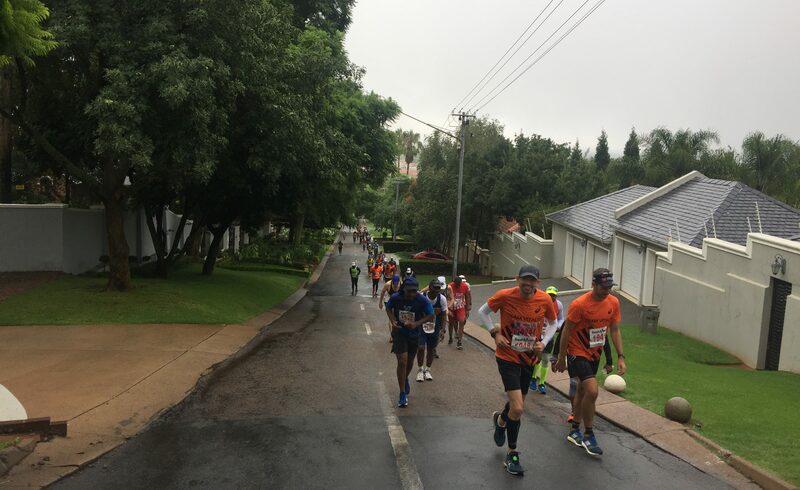 The word on the street was that this was a route that crammed every hill they possibly could into 42 kilometres, so it was with some trepidation that I arrived in Pretoria on a rainy Saturday morning. The toughest course on offer at the University of Pretoria. I spent much of the first half running with the Welthagen brothers. 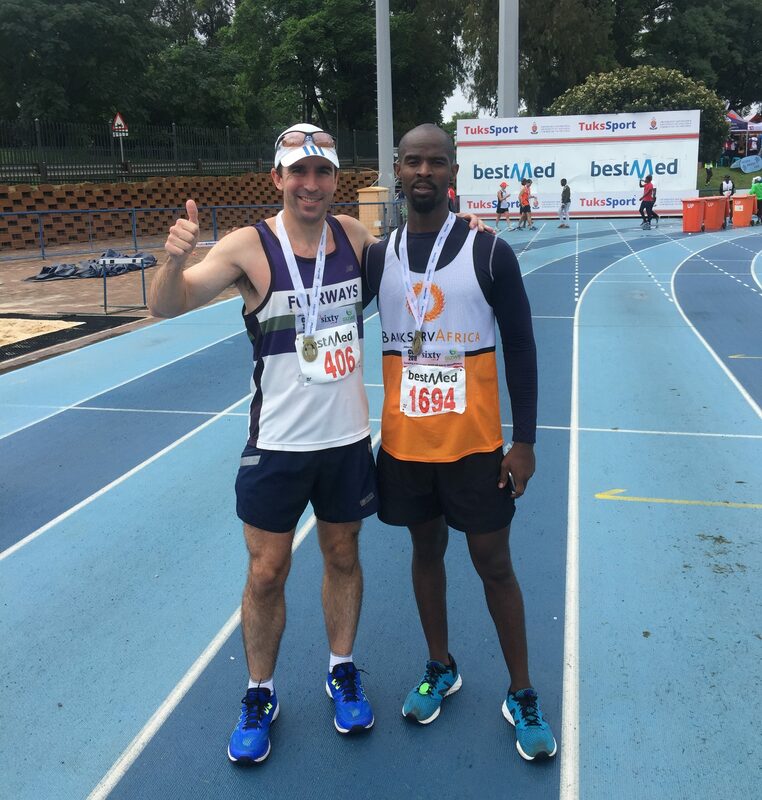 Jacques (the taller, younger and slower of the two) was a 2018 couch to Comrades finisher who shed about 40 kilograms getting to the start line in Pietermaritzburg. 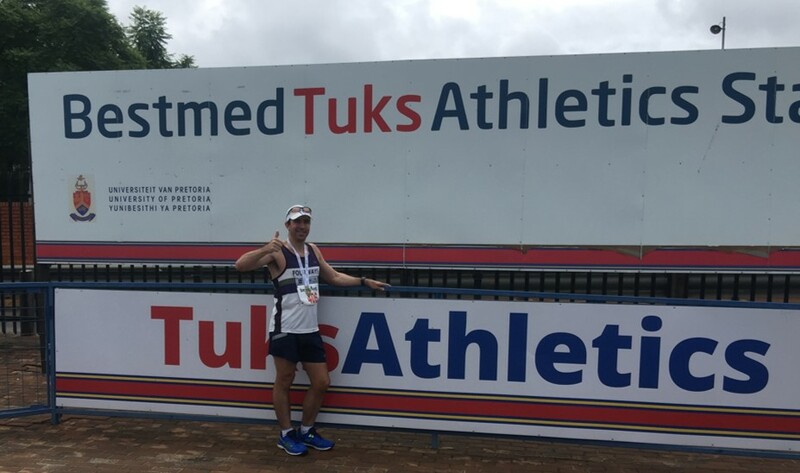 He estimates that he shed about a quarter of this weight during the inaugural Tuks marathon in 2018 when temperatures reached the high 30°Cs (around 100°F) – and there were tales of runners dropping out faster that first year actuarial science students. The Welthagen brothers cruise up one Pretoria’s Embassy Avenues. Jacques (on the right) dropped 40kg on the way to his couch to Comrades journey. 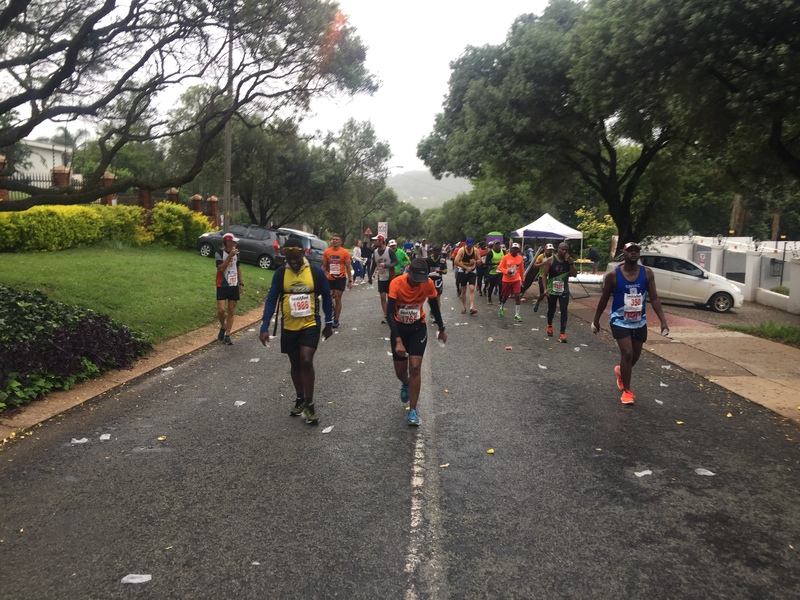 The 2019 edition featured the same tough hills but we were much luckier with the weather as the remnants of an overnight highveld thunderstorm stuck around, providing thick cloud and light drizzle for most of the race. Your undergraduate degree starts with fresher’s week – an easy 10km through the suburbs of Hatfield, Sunnyside and Hillcrest as well as incorporating some lovely stretches through the university campus. Cruising passed a retired jet fighter on the UP science campus. Unfortunately, for a Stormers supporter, there was a traumatic trip passed Loftus Versveld. You run passed the home of the Bulls and the cows during the Tuks Marathon. A mighty storm bashed Pretoria University’s experimental farms overnight and the feeble Stormers followed later that afternoon with a visit to Loftus (losing 40-3). Although heavy clouds meant we never saw the sunrise, we did see the suits of Sonop Koshuis just after dawn. They manned a table and marshalled several intersections. First year Sonop students can only leave the residence wearing a jacket and tie – and only get to take them off after their last exam and baptism in the waters of Fountain Circle. Although heavy clouds meant we never saw the sunrise, we did see the suits of Sonop Koshuis just after dawn. After 10km, fresher’s week is over and you start the feel the pressure. The party ends abruptly via a series of stringent tests and rigorous examinations for the better part of 26km through the shaded, barricaded suburbs of Groenkloof, Brooklyn, Waterkloof, Menlo Park and Lynwood. The body language says it all – not much running going on up this hill. The highest point of the race is just after halfway mark after which there is some respite with a short mid-semester break – but the holiday is brief as you once again head straight back into more testing hills. Pretoria hosts 135 embassies and consulates and the course covers several of the Embassy Avenues. Located towards the top of Lawley Road, I doubt that there is any commission higher than that of Trinidad and Tobago*. With the current spate of load shedding, I did wonder whether they resorted to sending smoke signals for communication when the wi-fi goes down (but realised that I might have got West Indians confused with other types of Indians). * I did check on the location of the Jamaican High Commission: Although they are on the third floor of an office park in Sunnyside, they are definitely lower than that of Trinidad and Tobago. Amongst the Tshwane hills, is there any commission higher than that of Trinidad & Tobago? The route has about 700m of climbing and most of this occurs between kilometres 10 and 36. 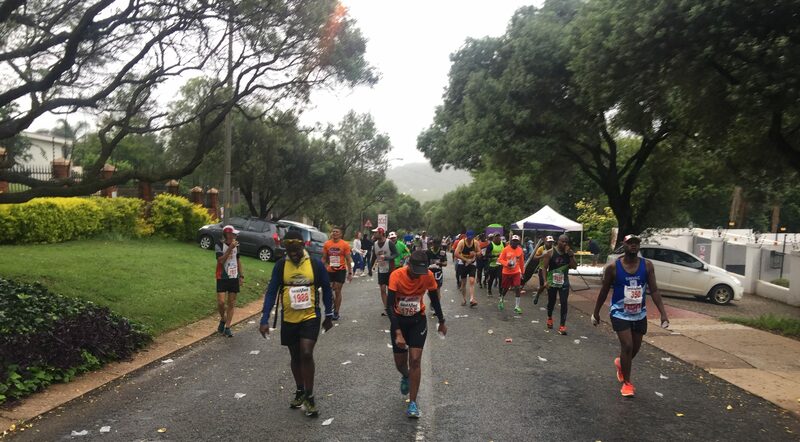 However, your tertiary education isn’t complete without a party or two – and this race offers festive tables as well as musicians and bands along the way to ensure that there is a bit of playtime amongst all the hill work. 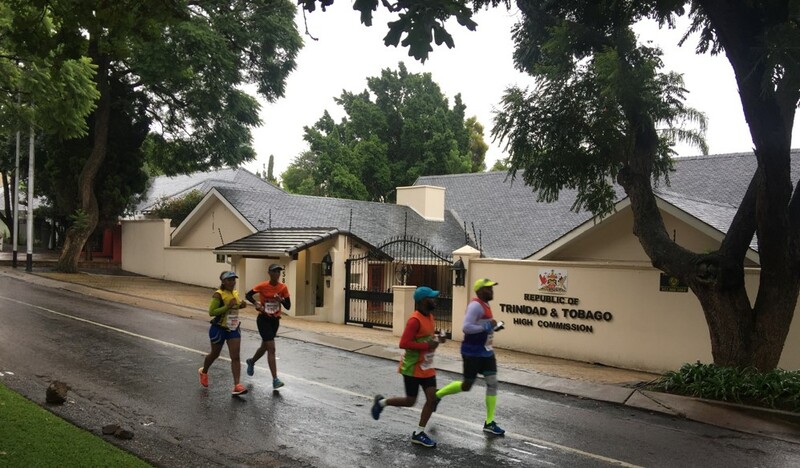 The plucky Fiddlers on the Route braved the rain to entertain the Tuks Marathon runners – whilst those who like hitting a few bars in the morning bounced home to the beats of Marimba #3. Having sorted out the men from the mice and the lionesses from the pussycats, gentle downhills dominate the last 6km all the way to your graduation ceremony in the Tuks Athletics Stadium. Sands Nkosi and I compared the hills of Tshwane to those of Eswatini. 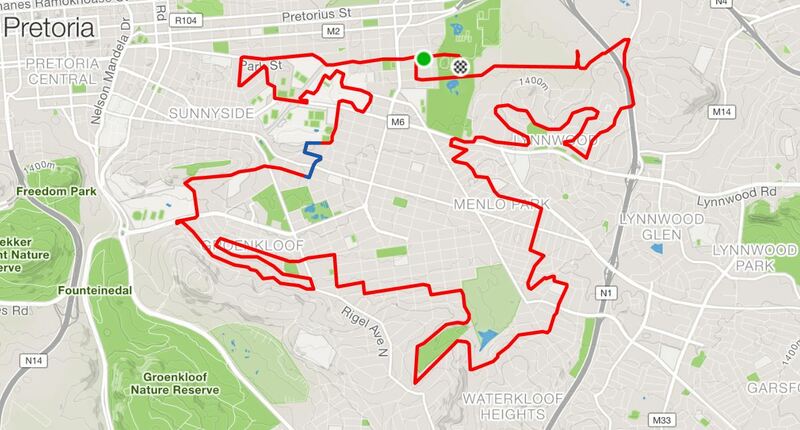 This is definitely a difficult course but, from I had heard from fellow runners, I was expecting worse. Those who think those who think Pretoria routes are the toughest in Southern Africa – you need to explore more! Over time I am hoping to get the elevation gain of every South Africa marathon and ultra for comparison but anecdotally I can tell my legs took more of a battering at Surrender Hill marathon two weeks later. I drove to the race with Sands Nkosi and we discussed the route difficultly on the drive home, deciding it was probably a four out of five. Sands and I met during the Imbube Marathon in Swaziland which includes the toughest piece of tarmac on the planet that you’ll ever run (or walk) up: Malgwane Hill. 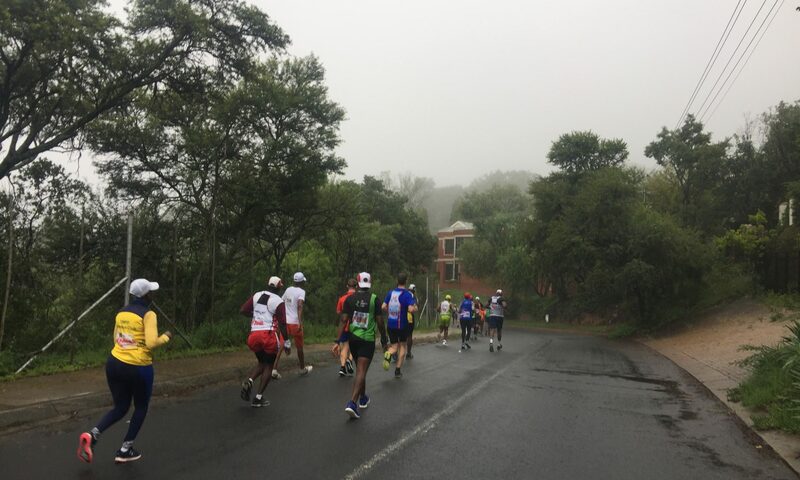 We agreed that we should keep a ‘Malagwane Hill profile’ in our pockets to pull out and ‘Crocodile Dundee’ complaining runners (as in “That’s not a hill, this is a hill!”). Tuks is tough but we’ve seen worse: A comparison with the Surrender Hill and Imbube Marathons with profiles at the same approximate scale. My eyes are fine-tuned to spot beer at the end of a marathon and I got really excited when I saw the sign below. My eyes are fine tuned to spot any sign of beer at the end of a marathon – and I got really excited when I saw this sign. 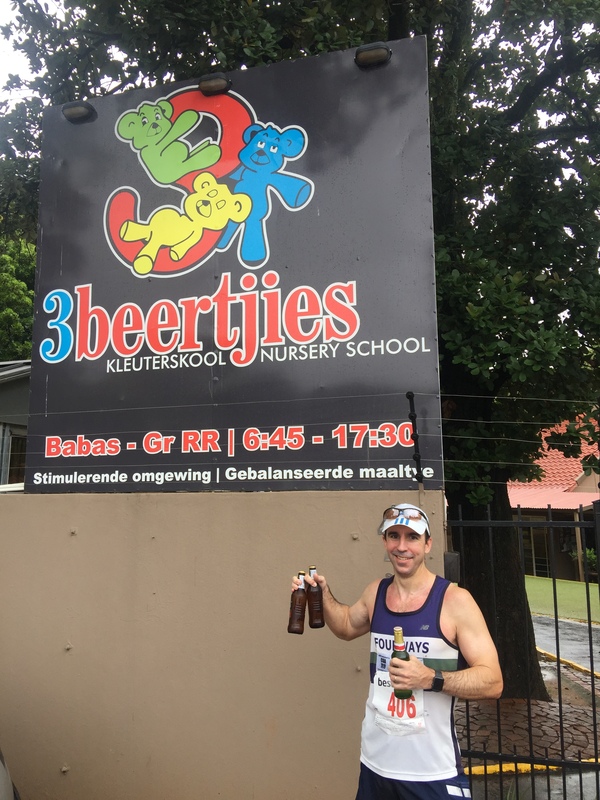 My Afrikaans skills are rudimentary at best but on closer inspection I realised it was a nursery school – fancy calling your nursery school “3 Little Beers”!? The Auto Investment Holdings table was directly across road and they obliged by supplying 3 little beers so that I could try to correct the sign (and they let me keep one for my troubles). Fancy calling your nursery school “3 Little Beers”? By the looks of it, the poor little yellow bear is all partied out and the blue bear’s eyes are looking very glazed. On reflection, a sequel to the original Goldilocks story might be required – ‘Goldi-dreadlocks & the Three Beers’. The plot outline would involve a washed-out alcoholic with a long record of kleptomania breaking into your house (I’m thinking Bathabile Dlamini in a blonde wig), stealing your tax money, eating your food, drinking all your beer and then passing out in your bed. All good fairly tales need the introduction of a wolf – mine would be dressed in leopard-print clothing. Although I’m not quite sure how this story would end, it probably involves a disgraced former president taking a shower. The last section of the race is through the innovation hub and experimental farm on the university’s agricultural campus. You run passed orchards, livestock and living experiments. This was a lovely way to end the marathon – and amazing to find there is a large farm in the middle of one’s capital city. The lovely home stretch through the experimental farms on the UP agricultural campus. You feel like you’ve completed your syllabus when the finish line comes into sight. 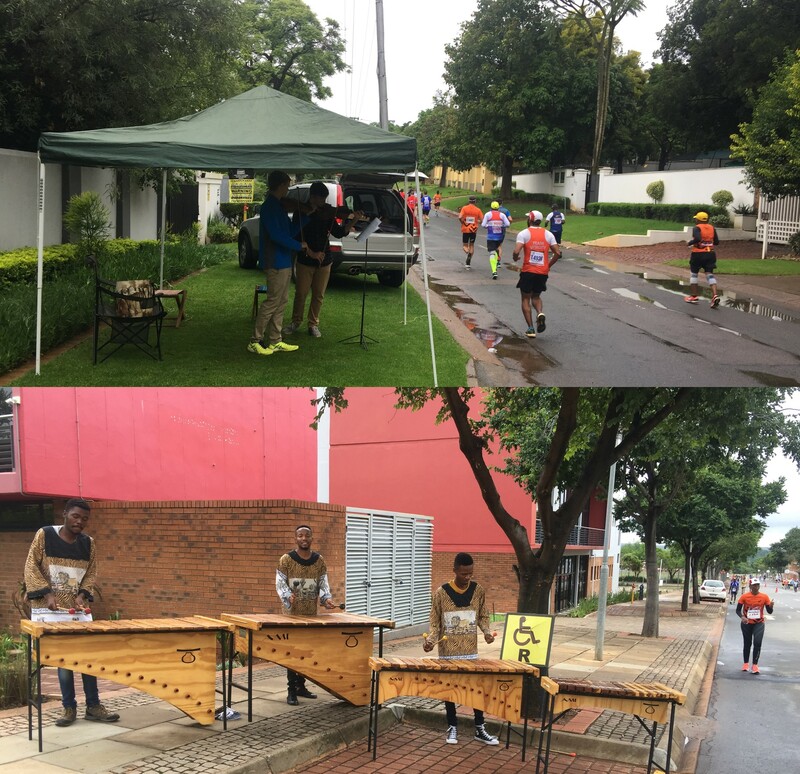 Unfortunately, there is still the better part of 2km to go and the academia who organise this event fill your last week of term with a community service loop around Hatfield before re-entering the campus. 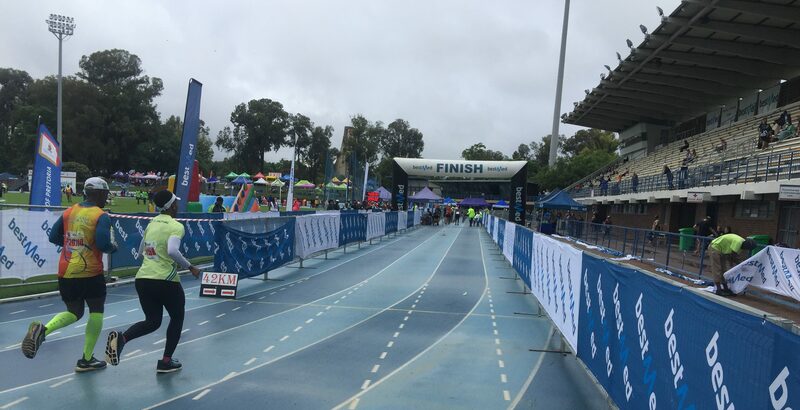 The finish is in the wonderful Bestmed Tuks Athletics Stadium and if you want to impress the crowds in the grandstand you can show off your sprinting skills with a 100m dash to the finish line. Test your sprinting skills with a 100m dash over the superb Tuks Athletics Stadium track. Luckily I had nothing to prove and no one to impress so I just plodded over the line and was not out of breath when an eager Manfred Seidler muscled-up, thrust a phone in my face and asked for a quick interview for his new weekly running podcast. Covering a diverse array of topics, the Runnersguide Radio Podcast is a great new addition to the South African running scene. My interview talking marathon running around South Africa features in episode three (below) and you can find all the episodes here. I have now run all the Gauteng North marathons but have never run any of them twice. However, this is a race I will definitely be returning to – a tough course but those who complete it know that they’ve earned a quality undergraduate degree and are on the fast-track to honours at Two Oceans and Comrades. Signing out from the Bestmed Tuks Marathon. Look out for the next race report from the Hippo Marathon in Richards Bay. Thanks Gary. Still plenty more to do. I currently have a backlog of 4 marathons so there’s plenty more to come! Awesome article as usual!!! !Cant wait for your article each week!!! Glad you enjoyed it Jacques – I tried to track you down on social media but could only find other Jacques Welthagens! O,sorry about that. I decided to a break from facebook this year. Thanks again!! !